First, click this button to create a new Sprite. Go ahead and create your "Level Up" mini-splash screen. Making a second mini-splash screen is almost exactly the same as the first. 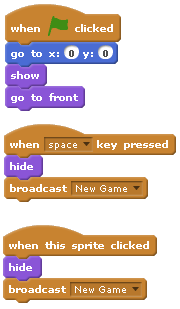 Create the object (sprite) and the code is the same except for the broadcast message that is received. 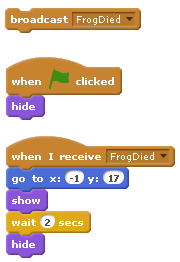 And this means that a broadcast message must be sent at the right place - when the Frogger realizes that it is dead. (to be sent after the last life is gone). Therefore, all we need is a new object (a splash screen that is full size) and similar code blocks to the ones used for the mini-splash screen. When drawing, be sure to click the "=" button so that you know your splash screen is the right size! Watch video if you can't find this button. Can you figure this all out before the next video? Making the "Game Over" splash screen to appear properly. Allowing the player to play again. "When the Green Flag is Clicked"
"When I Receive [New Game]"
The Welcome splash screen similar but not the same as the GameOver splash screen. 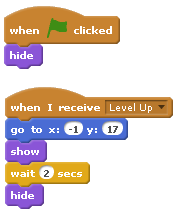 Then, you need to fix the code so that the Welcome splash screen appears when the green flag is clicked. Also, you'll need to change your Frogger code.